Amazon is allowing white supremacists and hate groups to generate revenue from their platforms. 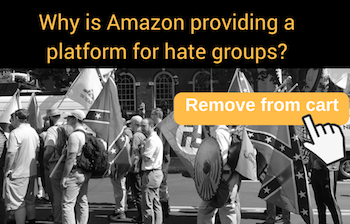 Demand Amazon stop funding hate ! After white supremacist Dylann Roof murdered nine Black churchgoers in Charleston in 2015, Amazon said it was banning the sale of Confederate flag images from its site and stepping up enforced of their anti-hate policies, but it's clear from this latest report that Amazon has not taken the growth of white supremacy on their platform seriously. Amazon must take an immediate public stand against this hate and violence, and take action to ensure that it is not profiting from hate or enabling others to profit from hate. Normalizing white supremacist, Islamophobic, and anti-Semitic extremists puts our communities at risk -- and yet the country’s largest online retailer and largest distributor of e-books is providing these groups with a platform to spread their ideas and generate resources to support their operations. We now have an unprecedented number of white supremacists running for elected office,5 a Presidential administration that’s demonizing Black and Brown immigrants and attempting to denaturalize citizens,6 a Supreme Court that upholds racist travel bans,7 and another Unite the Right rally being planned in our nation’s capital.8 The time is now, more than ever, for corporations like Amazon to take an unequivocal stand and say “no” to hate.